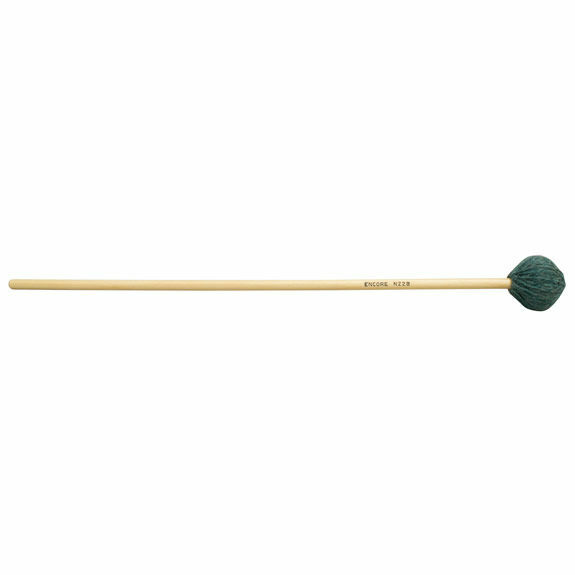 The Encore NZ2B Nancy Zeltsman "Medium Harder" mallets speak very easily, and produce a clear, warmer sound-perfect for playing a melody with the upper mallet. These are intended for more general use than the NZ1s. Birch Handles. These mallets have a really great and warm sound even in the upper register. Not as articulate as I would like but maybe I just need to play them in for a bit. I bought these without trying first, and I wanted a harder mallet for Creston's concertino 1st mvt. In mine and others' opinions, these aren't the right mallets for this piece, you need something with more articulation that will also speak in the upper register. For this I recommend the balter 22's or 21's. Also the head is fatter than I expected, which is really only an issue when playing fast chromatic notes. Otherwise, great mallets, great quality and I will use them in other applications. When Terry says they will virtually last for ever she means if you never play them... mine lasted two months (of very intense playing)! The cores make cool multi-perc mallets. However, NZ series are the greatest sounding mallets whether you're playing loud/fast Japanese rep or some sweet Bach. The Nanae Mimura's are a little heavier if you like more weight. These mallets are better and more durable than anything else I've played with. They're not too heavy and not too light. Highly recommended. These mallets are perfect. They sound great on concert marimbas and will virtually last forever.